Saturday was another Laamiga drop-in/knitting day in Islington. I wasn’t sure whether Fatima would turn up, but there she was, sitting in the garden with the other women with knitting needles in her hands and a ball of joyfully coloured wool on her lap. She was laughing – something she has not done much recently. Fatima came to the UK two years ago from Iraq. She had lost her husband and, fearful for her own life, she fled, leaving everything behind. All she wanted was to feel safe again and rebuild her life, but the uncertainty continued as her UK asylum case lurched from hearing to hearing. Emua at Laamiga asked me to be a mentor to Fatima six months ago, partly because we speak the same language. Fatima’s morale was low, her thoughts were scattered and she struggled to communicate in English. We worked on pinpointing her priorities: rebuild her confidence and emotional strength and build a support network. Fatima went to English classes, joined an organisation providing psychological support to women and became more involved in driving her asylum case. Together we contacted her MP for support, and she now has the right to work. Fatima is reconnecting with the strong, independent woman she was before she fled Iraq. Carmen and Brigitte, too, were sitting in the sun at the knitting circle on Saturday. Brigitte is a single mother of two who fled the Congo some years ago. She wanted to be a nurse but when she and her mentor Carmen started working together in 2012, her confidence was rock-bottom, she was isolated and didn’t feel she had the skills to complete her nursing foundation course. Carmen, who has a PhD in computer science, first helped Brigitte on practical issues such as hospital care for her son and dealing with housing problems. But Carmen’s biggest contribution was in the areas of academic writing – how to plan and structure essays, use PowerPoint and Excel and conduct basic research – and improvements to her spoken English. After four years of working with Carmen, Brigitte is now in the final year her of social care degree and is doing well. If you would like more information or would like to join a knitting/drop-in circle, please contact Emua Ali at info@laamiga.org or check out http://www.laamiga.org. 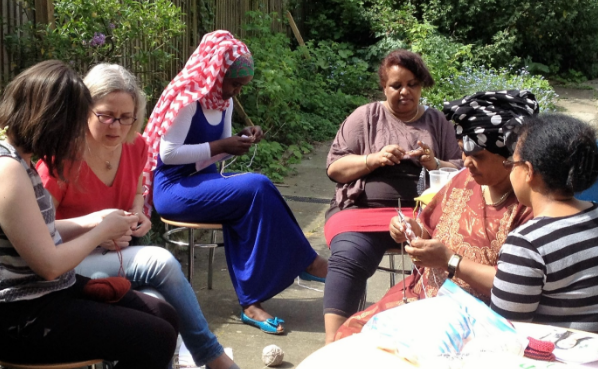 * Laamiga hosts a drop-in/knitting circle at partner organisation Arabic and Tigrinya speaking women’s group once a month. Wool, needles and knitting tips are provided courtesy of volunteers Heather, Judith and Liz.